There are only 6 seats per class. Sign up to secure your seat! the class that will demystify raw food! 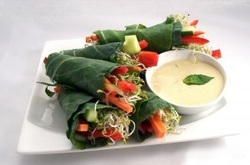 Learn great new RAW FOOD recipes. Attend Kazzrie’s class and you’ll be inspired to make healthy changes in your diet. A lucky find for beginners, but even experienced raw food enthusiasts will find new information in this flavor- and action-filled class! Your first several treats include drinks that nourish you, indulge you & satisfy you! * Nut Milks. Yes, you can make your own dairy free milk and it takes literally 2 minutes, start to finish, and requires only a blender! 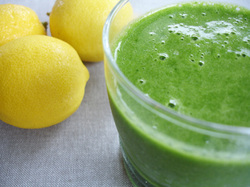 * A kickin’ Fruit Smoothie and a delicious Green Smoothie. Plus, why even those on a standard diet need this one drink to kick their health into high gear (painlessly!). Next we’ll completely destroy the idea that salads & green-based meals are b-o-r-i-n-g.
* The Easiest Burrito Wrap Ever. But this isn’t just about the wrap. It's also about the variety of different sauces, spreads and dips that you can easily prepare to create lots of variety! * For a few final indulgences, we have two potluck favorites (the truffles and pasta seem to be making their rounds at potlucks all over the world!) and Cream of Mushroom Soup that would put almost any traditionally creamy soup to shame. 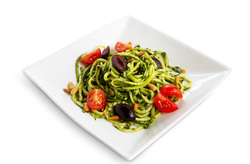 * You’ll learn why the pesto pasta is one countless people have called the “best they ever had”… and you will laugh as you see it takes just a few minutes to whip it together with some of the least expensive ingredients in the store! some tricks to making it easier than you ever thought possible… no matter HOW long you’ve been on this journey, curious, or dabbling. My goal is to make raw food easy without sacrificing the flavour or that wonderful feeling of indulgence that won’t let you down when you’re done thoroughly enjoying yourself! * the recipes and the hands-on experience to make them ALL! Contact Kazzrie for more info. Space is limited for each class. Sign up now to confirm your space. The Loft on Queen Street! 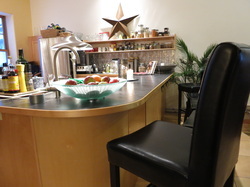 Ask Kazzrie about private raw food consultations and raw food classes hosted in your own home.